ABOVE: The Effe Erre Laundry is on Rugagiuffa, just south of the Campo Santa Maria Formosa. 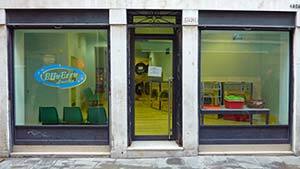 The Effe Erre Laundry is in the sestiere or district of Castello, within a few blocks of the Riva degli Schiavoni and the Piazza San Marco. The laundromat was open from 9 a.m. to 8 p.m. daily the last time we checked, and it has instructions in Italian and English that show how to use the machines. Look for the Calle del Vin, a narrow street leading off the waterfront promenade behind the S. Zaccaria vaporetto stop. Go inland and bear right until you reach a cross street where the Salizzada S. Provolo widens into the Campo S. Provolo. Cross the street and follow the Calle S. Provolo for a very short distance to the Corte Rotta, which will be on your left. Follow this street a few meters until it feeds into Rugagiuffa (also spelled "Ruga Giuffa"), where you'll soon see the laundromat on your left. Leave the campo at the southeast corner of the square, behind the back or curved end of the church. When you cross the footbridge, you'll be on Rugagiuffa. Look for the laundromat on your right as you walk down the street.